The Mindful Birthing Course combines the teaching of traditional antenatal classes with mindfulness practice and the programme is offered as group sessions. Each class is either two or four hours long and we will practice guided meditation such as sitting and walking meditation as well as mindful stretching/Yoga. You will learn about the normal physiology of labour with an emphasis on developing skills to work with pain. We will discuss positions in labour, pain relief, breast feeding and the baby cycle after bith as well as the neurological, biological, and emotional needs of the newborn. In addition to guided meditation during the classes there is an expectation that participants practice guided meditation at home for 15-30 minutes a day, 6 days a week in order to fully gain the benefit of the course. The classes build one on the other in a structured way so it is important to make best effort to attend the full course. No prior meditation experience is required. 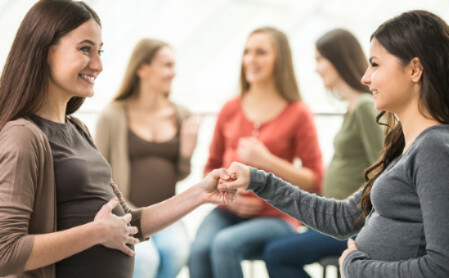 The course can be taken at any stage in pregnancy but it is suggested to start the class no later than the 30th week of pregnancy and bring the person who will be supporting you at birth. I can also offer private 1-2-1 sessions for general support in childbirth preparation. 2 options are available and venue and times to be arranged on an individual basis (call out charge apply if travelling more than 10 miles away from Bedford). Package 1: 2 hour session on labour and birth at a cost of £ 50.00. (An introduction to breathing techniques and other pain coping skills can be included if interested and time permits). This workshop offer an introduction to mindfulness meditation and one important aspect of childbirth preparation related to pain and fear. We focus on the physiology of pain and how mindfulness practice can help to 'uncouple' the sensory component from the cognitive component of pain. Through mindful awareness we can change our experience of pain. We see the difference between PAIN, which is a sensation in the body, and SUFFERING, which is a reaction in the mind.